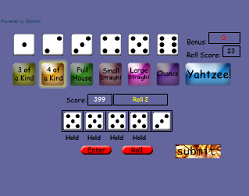 Now you can play Yahtzee online, anytime. Yahtzee is a simple brain game that trains analytical thinking. It's a classic dice game. To begin, click the Small, Medium, or Large link or Very Large button under the picture at left. This opens the game in a resizable pop-up window. The HTML5/Mobile version works on desktop computers and tablets. It is a similar game by a different developer. The object of Yahtzee is to score the most points by rolling five dice to make certain combinations. Note: If you often play Yahtzee on paper, check out my free Yahtzee Score Sheets and Triple Yahtzee Score Sheets. These score sheets are free to print and distribute. HOW TO PLAY. To start playing, click the red ROLL button. The dice can be rolled up to three times during a turn. If you get a good score combination on the first roll, you can keep the entire roll. To keep your roll results, click the button corresponding to score combination you have. For example, if you have four 3's and a 1, click the orange "4 of a Kind" button. Then click the red ENTER button to record your score. 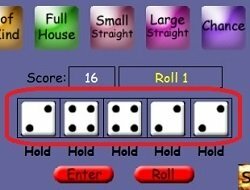 If you see a partial combination on the first roll, you can "hold" the dice you like and re-roll the others. To hold a die, click it once. The word "Hold" appears under the die. This can be repeated on a second roll of the dice. After the third roll, you must play whatever the dice show at that point. Each scoring combination has a different point value. Try to get as high as score as possible by the end of the game. If you like this game, you might enjoy related games on this site such as Reversi, Checkers, and Dominoes. Five of a Kind. If all five dice show the same value, you get 50 points. This is known as a "Yahtzee". Chance. You can use this score combination when you end up with random numbers that don't match any of the other score combinations. Large Straight. This is five dice in a sequence. Example: 2,3,4,5,6. Small Straight. This is four dice in a sequence. Example: 1,2,3,4,6. Full House. This is three-of-a-kind plus two-of-a-kind. Example: 4,4,2,2,2. 4 of a Kind. This is four of the same number. Example: 3,3,3,3,1. 3 of a Kind. This is three of the same number. Other than Chance, this is the easiest scoring combination to get. Each score combination can be used only once during the game. You can also earn points using the upper section. For example, if you have already claimed the "4 of a Kind" but then roll "3,3,3,3,6" you can still get points by clicking the "3" die in the upper section of the game. In this case you would earn 3 x 4 = 12 points. If you score a total of at least 63 points in the upper section, a bonus of 35 points is added to your score. Yahtzee has its roots among dice games such as the Puerto Rican game Generala and the English games of Poker Dice, Cheerio, and Yacht. 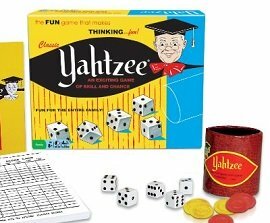 Today's version of Yahtzee was patented by game entrepreneur Edwin S. Lowe in 1956. The E.S. Lowe Company sold Yahtzee to Hasbro in 1973. Hasbro sells over 50 million Yahtzee games each year. This version is single-player, allowing you to play Yahtzee online whenever you have a few spare minutes. Enjoy! Game distributed by Freegaming.de. Used with Permission.